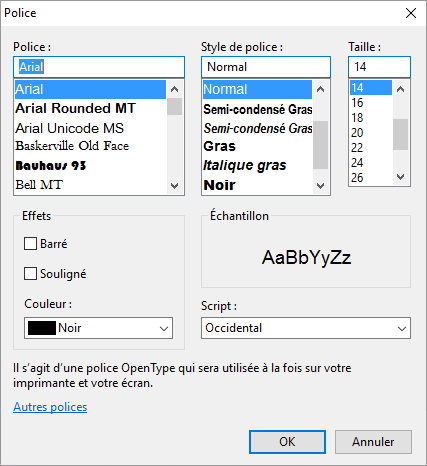 Opens the standard requester to choose a font. The functions SelectedFontColor(), SelectedFontName(), SelectedFontSize() and SelectedFontStyle() can be used after a successful call to get the needed information about the selected font. FontName$ The default font name to use when the requester is opened. FontSize The default font size to use when the requester is opened. #PB_FontRequester_Effects : Enable the requesters effects, including color chooser (Windows only). Color (optional) Sets the default color when the requester is opened. A valid color value you can get with the function RGB(). Style (optional) Sets the default style when the requester is opened. See SelectedFontStyle() for available styles. Nonzero if a font has been choosen, zero if the user canceled the requester. Message$ = "The requester was canceled."